After yesterday's notorious, far from refined guest, it is a pleasure to welcome a most romantic lady to the salon today. Juliette Drouet left behind a disciplined education for the life of a courtesan and actress. However, history better remembers her as the companion of Victor Hugo, with whom she exchanged five decades worth of passionate love letters. Drouet was born the daughter of tailor Julien Gauvain and housemaid Marie Marchandet, in far less illustrious circumstances than some of our previous guests. As a child she barely knew her parents and Drouet and her three siblings were orphaned when she was still naught but an infant. The children were sent to live with their uncle, René Drouet, and he enrolled them in a strictly religious boarding school, where the highly intelligent and somewhat precocious little girl shone academically. However, as she grew it soon became apparent that Drouet had no interest in pursuing a religious, academic or domestic career and instead she struck out with an intention of making her mark on society. Aged just 19, the beautiful young woman became mistress and model to sculptor James Pradier and the couple had a daughter, Claire, in 1826. However, Drouet was not satisfied with the life of a muse and with Pradier's encouragement she decided to try her hand at an acting career. 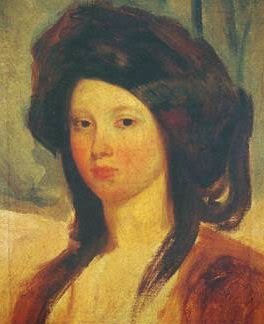 Beautiful, highly intelligent but possessed of a fiery temper, Drouet soon became known to Paris as a woman of passion and impulse. In 1833 she met Victor Hugo and abandoned her four year acting career to devote herself full-time to life as his lover and companion. Drouet's daughter, Claire, adored Hugo in turn and when the girl died of consumption in 1846, Drouet and Hugo mourned her together. 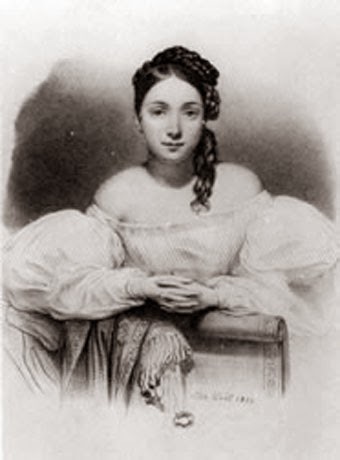 Claire's death came just a few short years after the loss of Hugo's own child, Léopoldine, who had drowned alongside her young husband in 1843. Though Hugo was far from faithful to Drouet and she frustrated him with her constant financial extravagances, their adoration was without question and over the years that followed the couple exchanged hundreds of love letters. Their correspondence was later published and remains available today as a lasting testament to their devotion. I do not know where I may be this time next year, but I am proud and happy to sign my life-certificate for 1883 with this one word: I love you. Within six months, Juliette Drouet was dead; her lover of half a century, Victor Hugo, followed her two years later. Interesting post! I had to look him up and learned that the whole time he was with Juliette Drouet, he was married (well, until his wife's death). Did he and Juliette ever live together? They lived together sporadically but travelled widely as a couple; it was very much an on and off relationship! Thanks. That's the impression I had from Wiki. Sad, really, that they found each other after he was wed to another, a woman who bore him several children and likely loved him, too. I hate triangles.